The single stack 9mm semiautomatic pistol is one of the biggest markets right now for concealed carry pistols. More people are buying single stack 9mm pistols to concealed carry than any other type of gun and for good reason. They are effective self defense tools providing excellent ammunition capacity, especially when compared to alternatives chambered in .45 acp and other larger calibres. They may not have the raw power of the .45 but they are easier to shoot with much more manageable recoil and are a great gun for hooters of all levels of experience. The Glock is a slimmed down single stack version of the glock 26, already a popular concealed carry gun the 43 is even more concealable and light weight than it’s tried and tested brother. The 43 was one of Glocks most anticipated releases after it’s announcement in 2015. If you are planning to carry this excellent firearm, you are going to want to take advantage of it’s slim and lightweight build and carry it inside the waistband to get the most out of it’s concealability. To make the most of this you will need the best iwb holster for Glock 43 you can find. The combat pistol cartridge has come a long way since the .45 long colt of the ‘wild west’, single action revolvers made way for double action revolvers and while the double action revolver and automatic pistol co-existed for the best part of a century we are now firmly in an era of the automatic pistol. The automatic pistol market is dominated by the 9mm parabellum and .45acp cartridges but there are other options. Some very compact pistols scale down not only the gun itself but the round it fires to ensure a very compact pistol, .32 is quite a popular cartridge for these very small pistols but in the day and age of single stack slim pistols like the Glock 43 .32’s aren't as popular anymore. .40 is a very popular round nowadays providing a middle ground between the hard hitting but equally hard recoiling .45 and the 9mm that isn’t always deemed to have enough stopping power. The advantage of 9mm over .45 though is the capacity of the pistols, a standard capacity Colt 1911 takes only seven rounds in the magazine while even the super compact Glock 26 takes ten and a full sized jericho 941 can take 15. This additional capacity gives a significant advantage over fewer harder hitting rounds for self defence. Alien Gear Holsters is an innovative company that mass produces great gear and keeps stock for many different models of handgun so you can avoid long waits for custom holsters and can get these direct from many good retailers. They made their name by making fantastic composite sheaths by laminating a standard piece of kydex which provides form fitting retention for your pistol to leather and neoprene for a comfortable fit. This makes the holster not only very functional and stylish but one of the most comfortable holsters on the market while still supporting the weight of your gun without being too rough on the pistol itself. 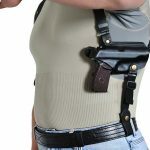 This holster has double belt loops and is made to be used for inside the waistband carry on your strong-side hip. It can't be used in any other location but seeing as this is the most popular place to carry, most people should be fine with this arrangement. This holster excels in the fall, winter and early spring when you're wearing a coat over it. This is because the triple layer construction that makes the holsters so comfortable, also makes it quite bulky and somewhat hard to conceal if you're of a skinnier build. If you just got a new pistol and need an excellent holster for concealed carry, this Alien Gear Glock 43 holster is one of the best options you can have. Available right off the shelf ready to go right outside the box this is an excellent holster for just about anyone who is carrying. 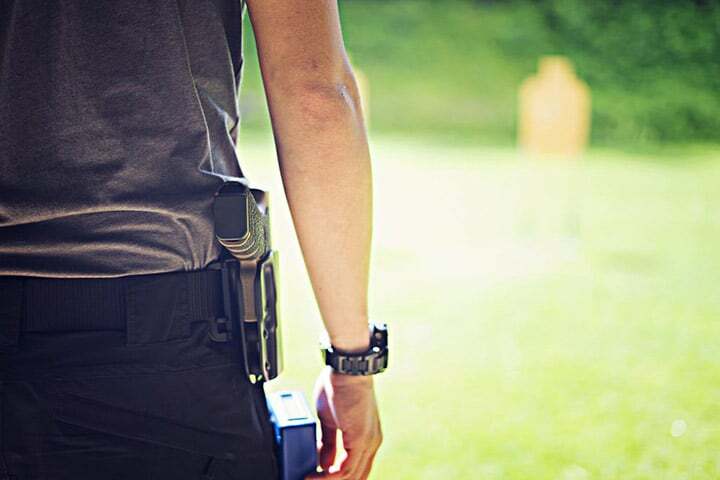 Kydex holsters are popular because they offer the right level of retention and rigid construction without being too expensive or needing any maintenance at all. This holster by Concealment Express is a perfect example of a well-made kydex holster from a good company that you can trust to carry your gun day in and day out. Most kydex holsters are pretty much the same so who you buy it from is really what matters. This is a good company that makes them by hand and ensures the quality of every single holster that comes out of their shop. It's a fairly standard design made from kydex and featuring a belt clip and adjustable retention. 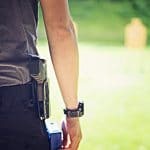 The kydex is non-porous and doesn't absorb any moisture, so you don't have to worry about how it'll smell at the end of the summer or if it's going to lose its shape or form like a leather holster might if it gets exposed to the rain. This is a decent holster that is extremely cost-effective that many people be able to use safely day in and day out as a concealed carry holster for the Glock 43. This is an injection molded holster that is a made from a single piece of durable plastic that holds your gun securely and safely inside the waistband for concealed carry. The moulded plastic belt clip is a bit on the weaker side but if you cinch your belt down you won’t have any problems with keeping the holster on your belt when you draw your gun. That plastic clip allows the holster to flex when you sit down making it slightly more comfortable than other kydex or leather holsters. As you walk around the plastic tends to flex and move with you rather than move against you with other holsters that include oversized metal clips. Overall, this is about as cheap as a holster can get and still be a reliable everyday carry holster. This is an interesting and innovative holster design that only surrounds the trigger housing on your Glock 43, protecting the trigger and trimming away every ounce of unnecessary weight. Many people might consider this holster to be unsafe. They’re wrong. 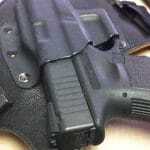 The purpose of a holster is to secure a gun to your person and make it safe to carry and this holster does just that. It’s a great design for people who want to conceal the tiny Glock 43 because it doesn’t take away from the compact size of the pistol by adding any necessary bulk or weight at all. It clamps onto the trigger guard is secured to your belt with a lightweight plastic clip. This is as slim and lightweight as a holster can possibly get. 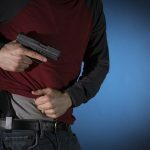 Beyond just jamming your gun in your waistband, which is a dangerous and stupid idea, this is as good as it gets for deep concealment of a backup pistol. If this is going to be your very first concealed carry holster, don’t consider this one as it is a fairly specialist and minimalist piece of equipment and you may want to practice and get a bit of experience first. However, if you have experience carrying guns safely already this may be a good option for when you are in formal attire or in T-shirt and shorts and don’t want to print more than necessary. If you’re looking for a decent quality leather holster to carry your gun this product from Outbags is more comfortable to carry around than a polymer or kydex holster. There’s not a lot to say about this holster. It is a comfortable leather design that will last for years because of the heavy-duty material it is made from. It is very comfortable to carry around because the overall construction is not very bulky or obtrusive. The leatter also has a tendency to flex with you as you move rather than work against you. The oversized metal clip firmly secures the holster to belt leaving no room for it to slide around. Overall this is a cheap and effective holster that is one of the best options for a leather inside the waistband holster for Glock 43. The glock 43 may not look like a heavy gun, but once it’s fully loaded and you add a spare magazine it’s certainly heavier than what most people carry in their pockets. This extra weight can be effectively carried with the proper belt and holster combination. 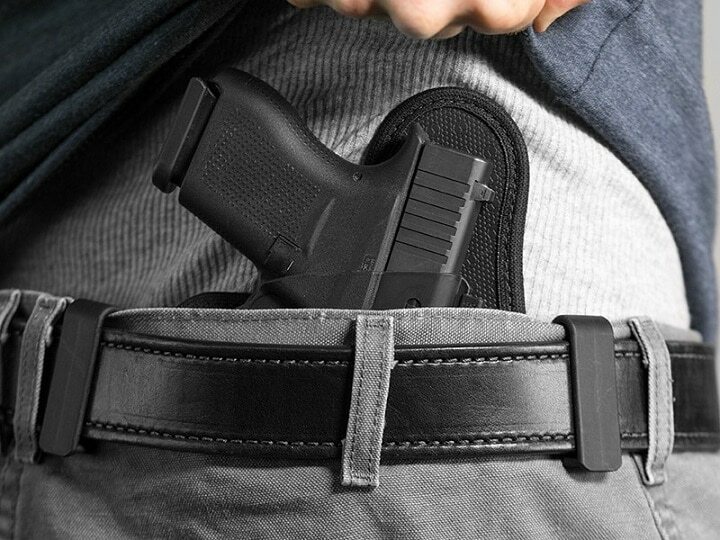 The belt you choose should be stiff enough to support the weight of the gun in your holster and should be large enough to distribute the weight evenly. Many of the small clip holsters that are available are excellent for concealment and minimal bulk but do an awful job of distributing the weight on your belt. That can be a problem with smaller guns as they may be lighter but the smaller holsters that carry them don’t distribute the weight as evenly. Look for ways to mitigate this by having the clips of your holster spaced out or by using a thicker belt. Both a double-lined belt or a 2 inch rather than 1 ½ inch belt will help. The Glock 43 is an excellent pistol for new concealed carry permit holders. It’s a slim and trim pistol that can be carried just about anywhere while still being potent in a self defence role. 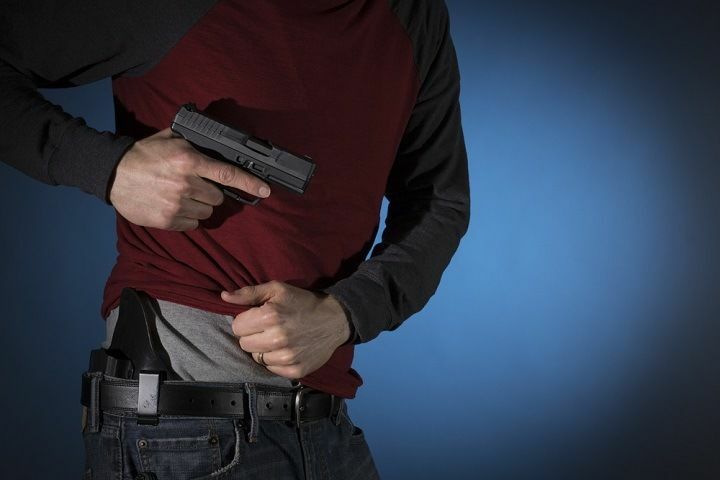 Look for ways that you can subtly change the way you dress to better accommodate the gun and get your hands on the best IWB holster for Glock 43 that you could possibly afford. 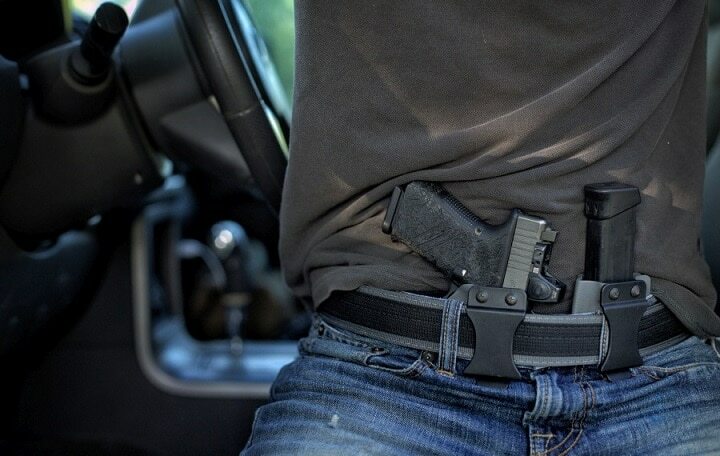 Holsters are not simply a means to carry your gun, they are a vital piece of safety equipment. Get out and practice your concealed carry. It is a skill much like shooting that you will get better at, with time.